Battle of Salamis Bay. Review Xerxes defeated the Spartans at Thermopylae. He marched his troops and sent his fleet to Athens. He ransacked and burned. 2 Review Xerxes defeated the Spartans at Thermopylae. He marched his troops and sent his fleet to Athens. He ransacked and burned a good part of the city including the Temple of Athena on the Acropolis. 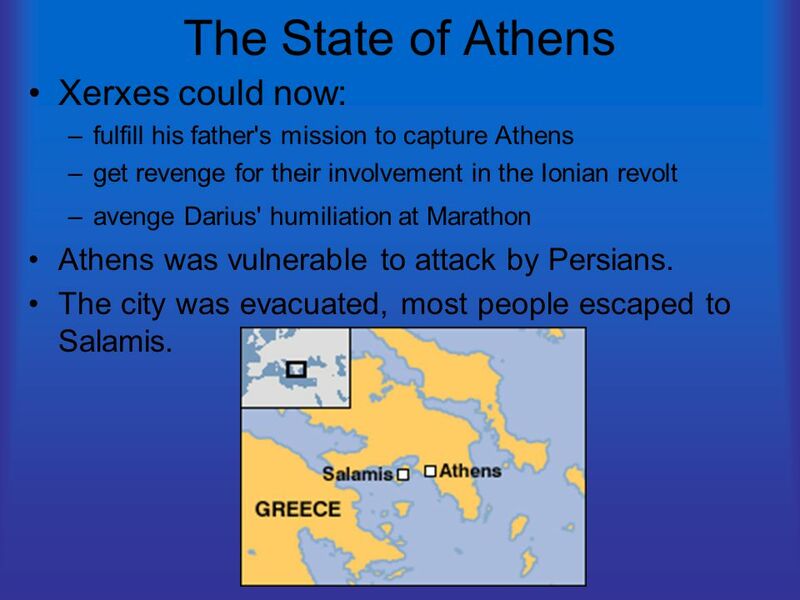 3 The State of Athens Xerxes could now: –fulfill his father's mission to capture Athens –get revenge for their involvement in the Ionian revolt –avenge Darius' humiliation at Marathon Athens was vulnerable to attack by Persians. The city was evacuated, most people escaped to Salamis. 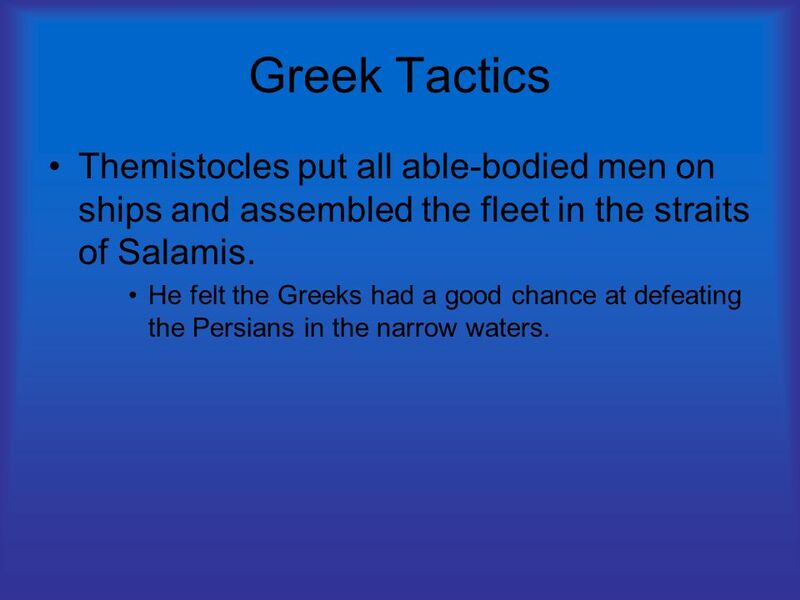 4 Greek Tactics Themistocles put all able-bodied men on ships and assembled the fleet in the straits of Salamis. He felt the Greeks had a good chance at defeating the Persians in the narrow waters. 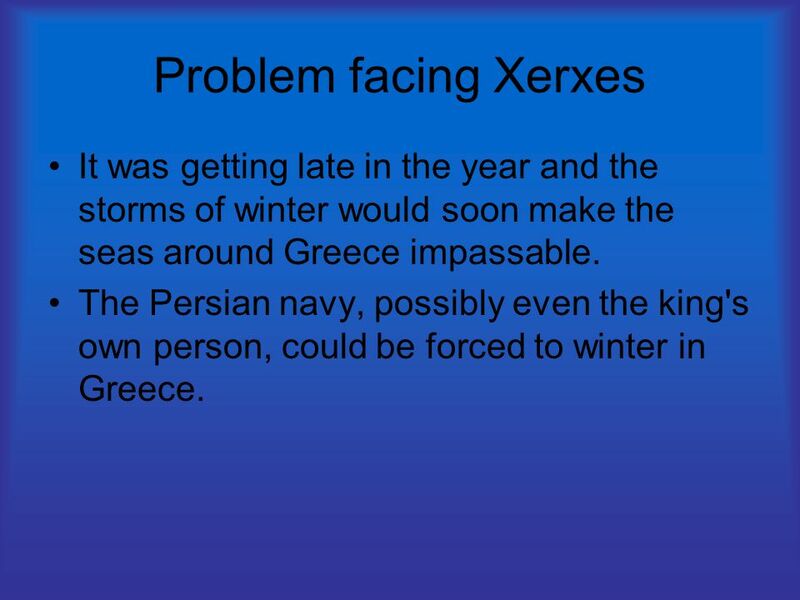 5 Problem facing Xerxes It was getting late in the year and the storms of winter would soon make the seas around Greece impassable. The Persian navy, possibly even the king's own person, could be forced to winter in Greece. 7 Xerxes Attacks Xerxes blocks off both ends of the strait. The entrance to the strait was narrow causing the fleet to break formation thus weakening them. He expects to find a fleet fleeing. Instead he is attacked. The Greeks drew the Persian fleet into the narrow bay. 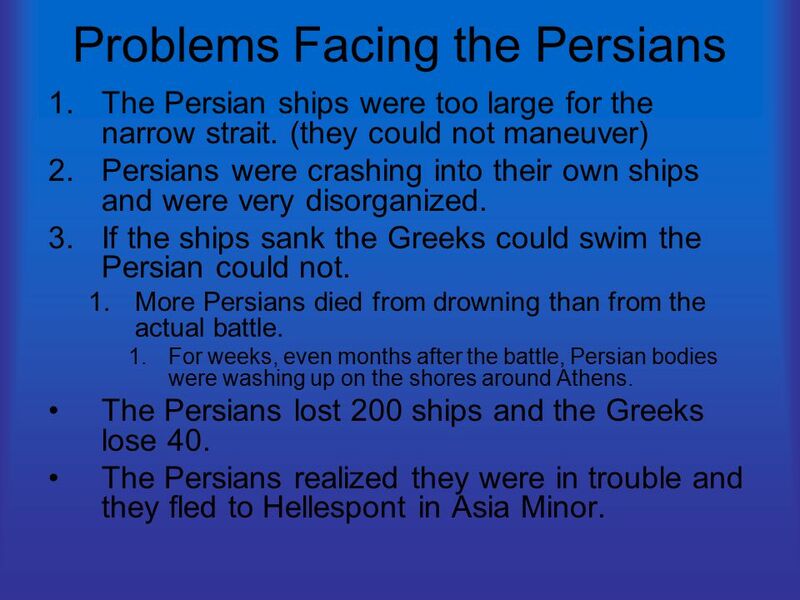 8 Problems Facing the Persians 1.The Persian ships were too large for the narrow strait. (they could not maneuver) 2.Persians were crashing into their own ships and were very disorganized. 3.If the ships sank the Greeks could swim the Persian could not. 1.More Persians died from drowning than from the actual battle. 1.For weeks, even months after the battle, Persian bodies were washing up on the shores around Athens. The Persians lost 200 ships and the Greeks lose 40. The Persians realized they were in trouble and they fled to Hellespont in Asia Minor. 10 Greeks Hot in Pursuit The Greek fleet followed the Persians. The trip was very difficult and took 45 days. Greeks took an oath: “I shall fight to the death to keep my country’s freedom, and if my fellow soldier is killed I shall bury him properly. I shall resist being conquered and will not lay down and die.” The Greeks were willing to fight for freedom. 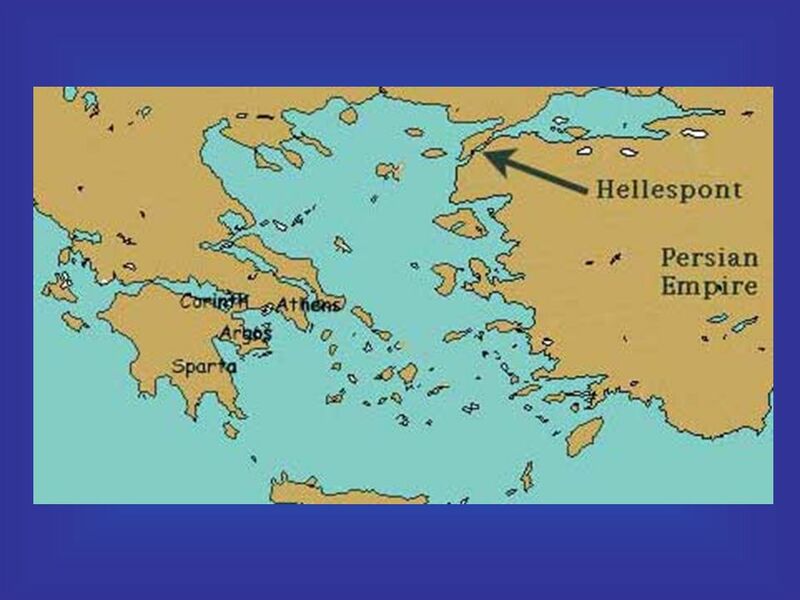 After realizing that Hellespont was too narrow for battle so they head south. 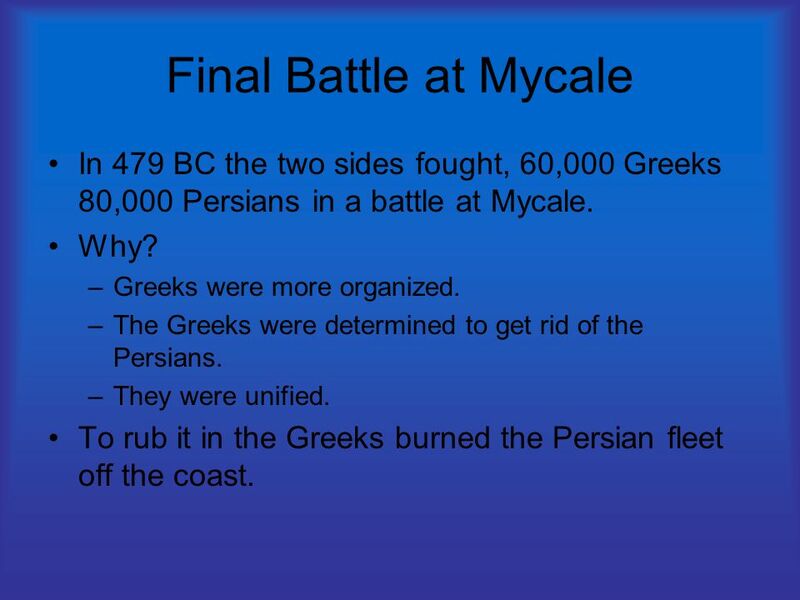 11 Final Battle at Mycale In 479 BC the two sides fought, 60,000 Greeks 80,000 Persians in a battle at Mycale. Why? –Greeks were more organized. –The Greeks were determined to get rid of the Persians. –They were unified. To rub it in the Greeks burned the Persian fleet off the coast. 12 What about the army? 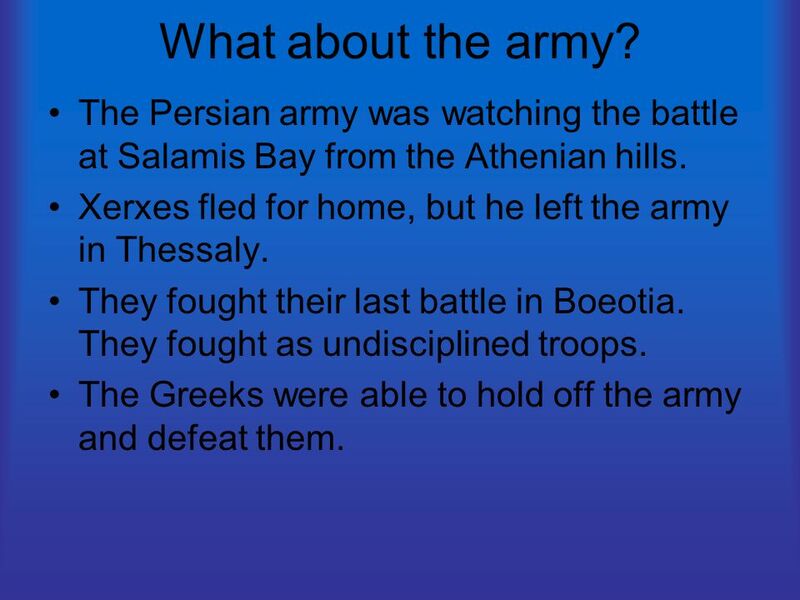 The Persian army was watching the battle at Salamis Bay from the Athenian hills. 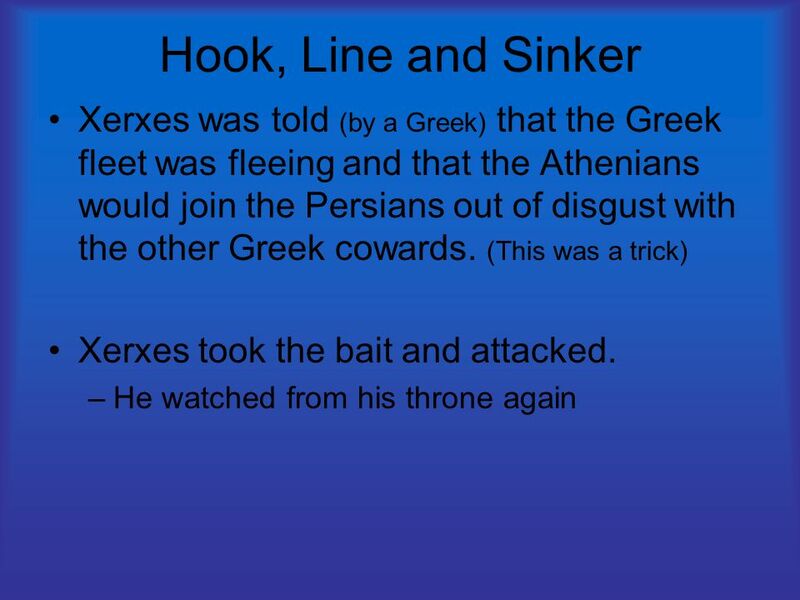 Xerxes fled for home, but he left the army in Thessaly. They fought their last battle in Boeotia. They fought as undisciplined troops. The Greeks were able to hold off the army and defeat them. 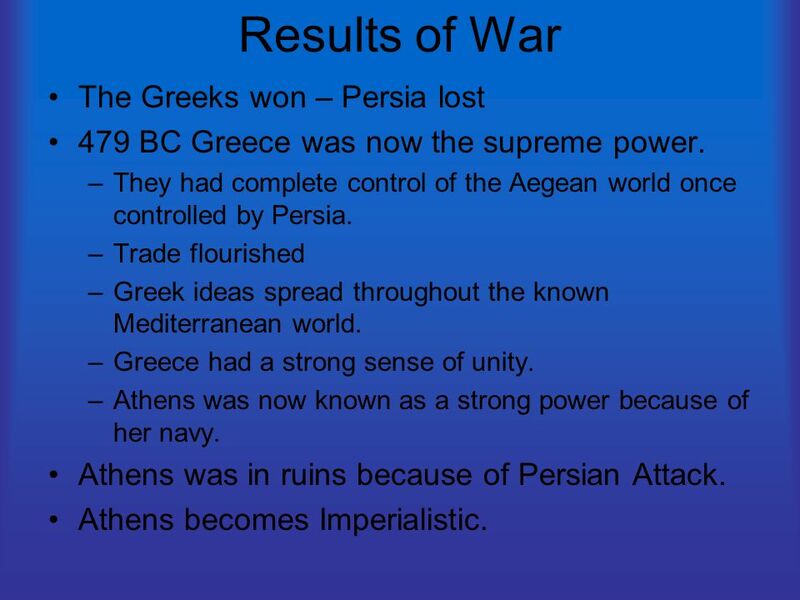 14 Results of War The Greeks won – Persia lost 479 BC Greece was now the supreme power. –They had complete control of the Aegean world once controlled by Persia. –Trade flourished –Greek ideas spread throughout the known Mediterranean world. –Greece had a strong sense of unity. –Athens was now known as a strong power because of her navy. Athens was in ruins because of Persian Attack. Athens becomes Imperialistic. 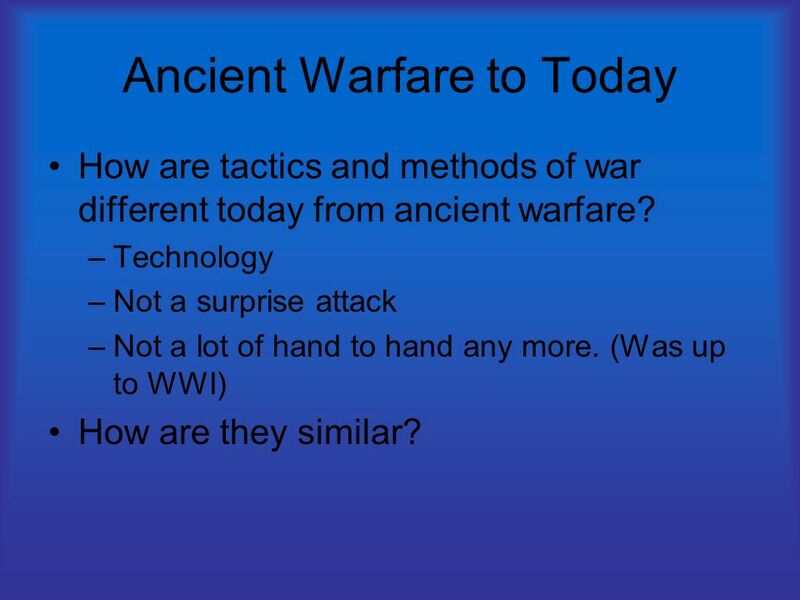 15 Ancient Warfare to Today How are tactics and methods of war different today from ancient warfare? –Technology –Not a surprise attack –Not a lot of hand to hand any more. (Was up to WWI) How are they similar? 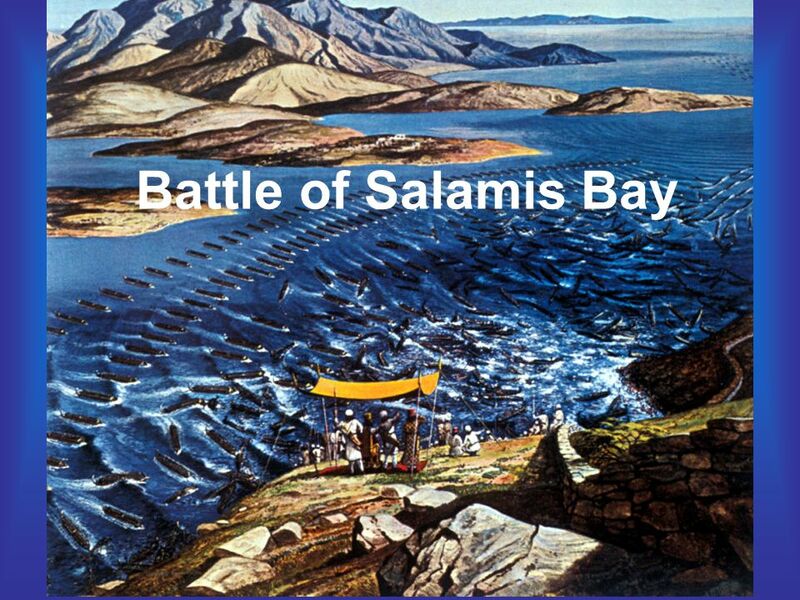 Download ppt "Battle of Salamis Bay. 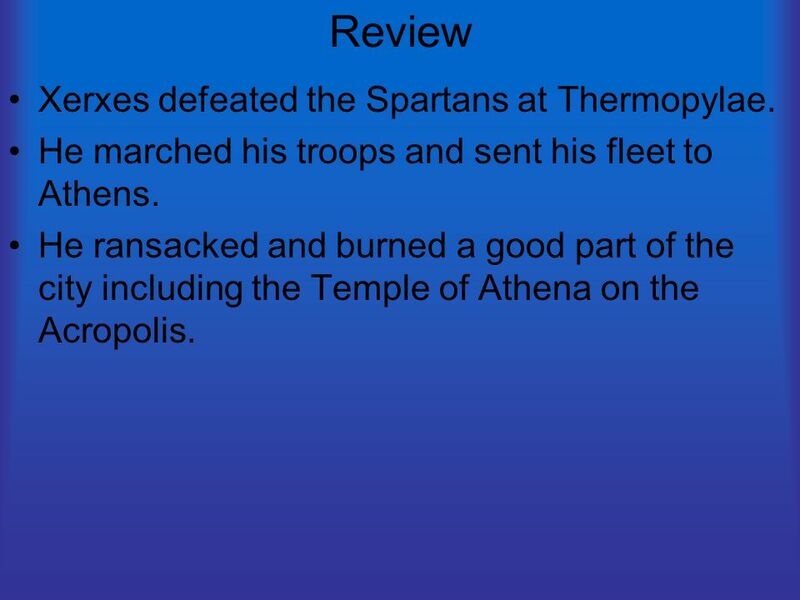 Review Xerxes defeated the Spartans at Thermopylae. He marched his troops and sent his fleet to Athens. He ransacked and burned." Today’s Title: Persian and Peloponnesian Wars DO NOW On this day in 1454, explorer Amerigo Vespucci was born. The continent we live on is named after. Pg THE PERSIAN EMPIRE Under Cyrus the Great, the Persians built an empire larger than any yet seen in the world! (559 to 530 B.C.). It was about. The Persian Wars Greece was not alone in the ancient world. Egypt was flourishing. Other civilizations were developing around the Mediterranean. One of. 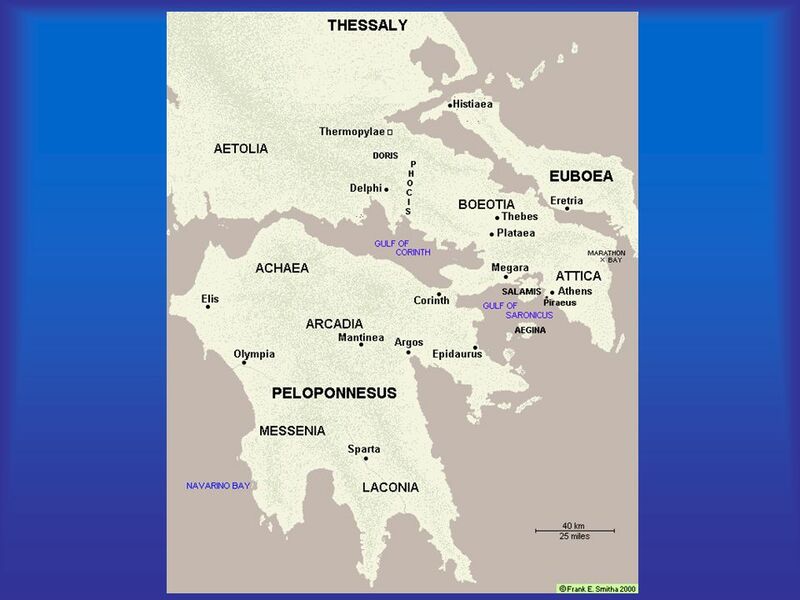 Athens and Sparta Unite 499 – 479 B.C.E. The Persian Wars Greece’s Finest Hours. The Greek World Greece and Persia. Persia Becomes an Empire The Persians fought other peoples of Southwest Asia in early history. The Medes would rule. By Mr. Fitzpatrick The students will learn the causes of the Persian Wars. The students will be able to describe the major phases of the Persian Wars. Chapter Persian Wars – (4:27)  From 499 – 479 B.C.E. Athens and Sparta had. 4.3 Persia Attacks the Greeks. The Persian Empire. The Persian Wars 500 B.C. – 479 B.C.. The Beginning Darius, king of the Persians, came to power and continued to extend the Persian Empire across Asia. R.A.P. Lions vs. Wildcats R.A.P. pg. 2(L). Reading Notes pg. 3R. The Persian Wars A rare time of alliance. Now they’ve done it… Persia conquered Ionia in 520 BCPersia conquered Ionia in 520 BC Ionians revolted & Athens. The Expansion of Greece: Persian Wars In 500 B.C. Greeks in Asia Minor rebelled against the Persians while Athens helped these city-states in their uprising.